£100 non refundable deposit secures your holiday with full cost plus £50 security bond to be paid minimum 6 weeks before. Bond will be refunded approximately 1 week after end of your holiday if caravan is left as found. Discount if booking 7 nights or longer against the cost of the published short break prices so please ask for price. Hire periods will start and end on either Mondays or Fridays unless a different day is agreed by ourselves. Friday to Fridays only in school summer holidays. Bedding can be provided for an extra cost. 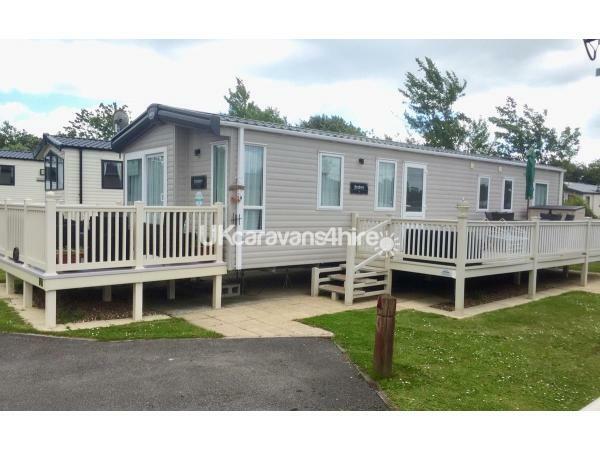 Our beautiful platinum graded caravan has double glazing & central heating throughout so is perfect for those out of season breaks or when the weather is not so warm. Free WiFi in caravan (depends on signal availability) for mobile phones, iPads, tablets etc. The caravan is in a cul de sac opposite the boating lake/fair/indoor & outdoor swimming pool/Lakeside facilities, only a short walk to main facilities. 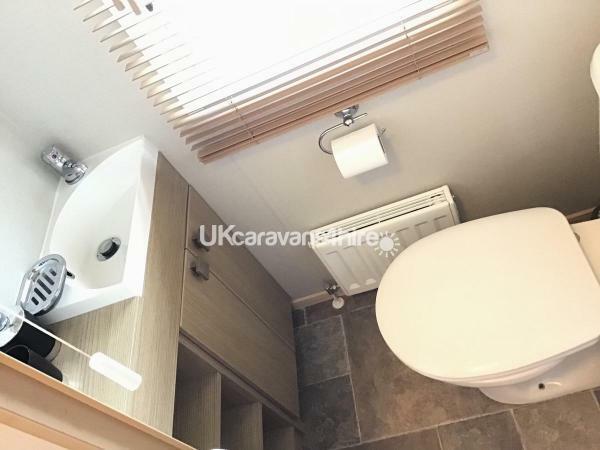 Our caravan interior has been given lots of personal touches giving this holiday home a more welcoming and comfortable feel. On entrance to the caravan here is a light, airy open plan living room/dining room & kitchen area with patio doors at the front allowing access to enclosed veranda. Through a door off the kitchen there is a corridor which leads to the 3 bedrooms, bathroom and toilet. There is one double bedroom and 2 twin rooms. There is a shower room with large power shower, sink, toilet, extractor & cupboards plus a second separate toilet with sink and storage. To the front of the caravan is an allocated tarmac car park space with parking for 1 car, with additional parking close by. To the side of the caravan is a 24' x 8 ' gated veranda which has a large rattan table and chairs ideal for alfresco dining, there is also an enclosed veranda to the front of the van with a Rattan sofa set, which is accessed via the sliding patio doors, ideal for relaxing with a glass of wine or two while you watch the sunset over the boating lake. The modern kitchen is spacious and comes complete with a gas hob with extractor fan, a separate oven with grill above, kettle, toaster, a large built in fridge/freezer, a built in microwave oven, halogen oven, steamer and all manner of kitchen gadgets, utensils and crockery - all perfect if you choose to cook for yourself. For your convenience there is an iron, ironing board, vacuum cleaner, hairdryer, travel cot and highchair provided free of charge. In the open plan living room/kitchen/diner there is a large comfy L shaped sofa, tall lamp, large coffee table, wall mounted electric fire, L shaped unit housing a 43" LED TV, DVD. There is also a Bluetooth HiFi unit with DAB Radio/CD/USB so bring your favourite music on disc/USB or stream wirelessly from your phone/tablet. A WiFi booster is provided so you can log in and access free unlimited internet whilst in the caravan. (Please note the availability depends on signal which is provided by Haven) There are some board games, DVDs, magazines and books, as well as local area information available. 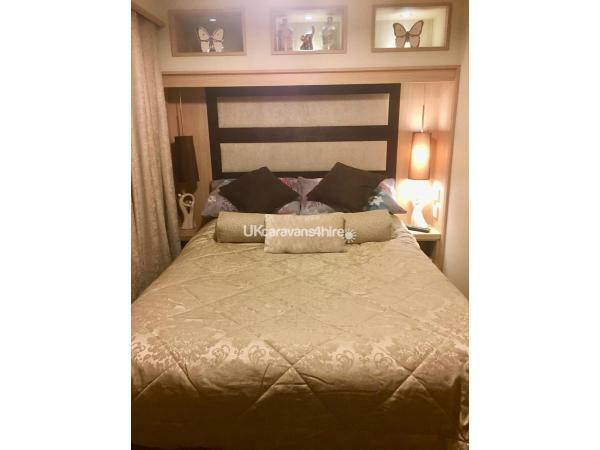 The 3 bedrooms all have a wardrobe, drawers, bedside cabinets, overbed units & bedside lights. The master bedroom has a 24" TV/DVD. We provide cosy and sumptuous duvets & pillows along with pillow and mattress protectors. You can either provide your own duvet covers/sheets & pillow cases or for a small charge to cover laundering costs we can provide linen and make the beds up for you. For your convenience there is a supply of cleaning products, to be found under the sink, as well as a vacuum cleaner - our holiday home is expected to be left in the same pristine condition that you found it in so please do feel free to make use of these! Please remember to bring your own towels, tea towels and a bath mat or two. Large bin liners are also needed for the kitchen. Gas and electricity are included in the price quoted, caravan is supplied by piped gas so no bottles to change. Entertainment passes are not included but these can be purchased quickly and easily from the main reception on arrival if required. what a lovely caravan in a nice location, not too noisy but not far away from the facilities. the caravan has everything you need and to a great standard. we love primrose valley and have stayed in this caravan before and will definitely keep coming back. Just returned from our lovely stay at this caravan. Caravan was extremely clean very spacious and comfy. Everything you need is there in the caravan. Free WiFi was an added bonus! The caravan is literally a stone's throw away from the lakeside bar and boating lake. We were all sad to leave and hope To return again soon. Just spent a wonderful 3 nights in this caravan. It was Lovely and clean and had all the essentials you would need (and more!) was in a nice, quiet area of the park too which was nice and peaceful but still only a short walk to the main complex. Free wifi was a big plus and Sheila and Elliot were very helpful from the start. Just wish we'd have stayed longer. Would definitely recommend. We have just enjoyed a great 7 day stay at this lovely caravan. The caravan is situated in a nice quiet location and is only a 2 minute walk from the lakeside restaurant. 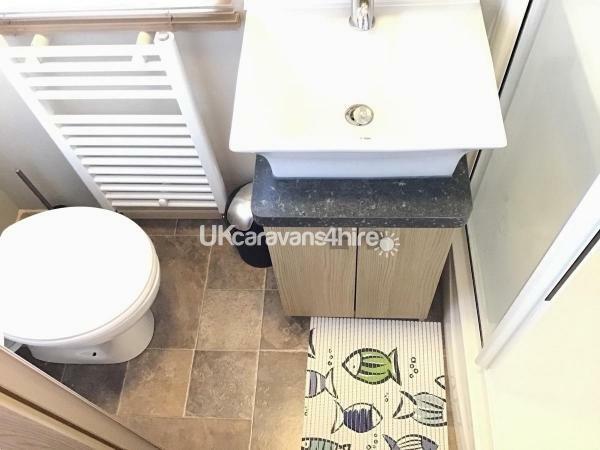 Very clean and tidy caravan with the added bonus of free wifi. Thanks for your lovely review. We are glad you liked our caravan and where it’s sited, close to new Lakehouse facilities. 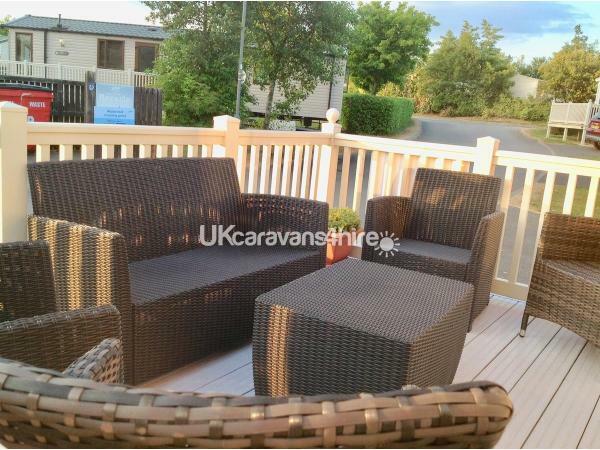 a fantastic stay in a caravan with everything you could need especially the free wifi. perfectly positioned near complex but not too noisy. will definitely be back. didn't want to come home. Just enjoyed a lovely Easter break in this caravan. Very clean and well equipped, wifi was an added bonus with 2 children! Nice location on park which will be very handy for the newly renovated Lakeside complex. Great outside space with 2 decked seating areas. We had one minor technical issue which was sorted with Sheila after a quick phone call. Would highly recommend and love to visit again! Thank you for your feedback Pauline. we are pleased that you enjoyed your stay in our caravan.